We are not like many consulting agencies that provide you with a set of recommendations and walk away. 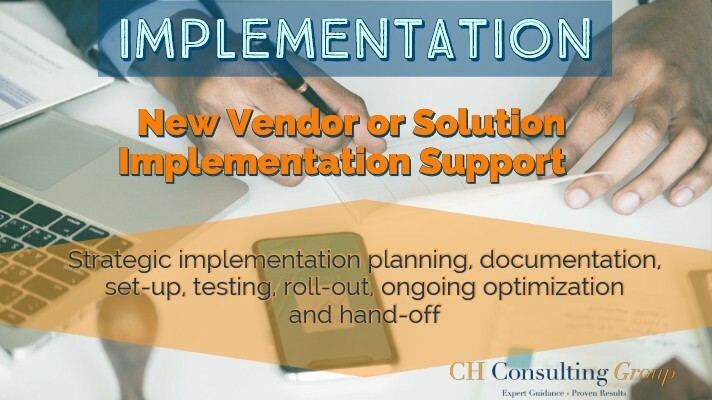 At CH Consulting Group, we give our clients a detailed roadmap and strongly encourage that we help guide them through the implementation process. You see, we are big on accountability at CHCG, which is why we like to see our operational and technical recommendations come to life. When we work with our clients on the implementation of our initiatives and they experience the cost savings, improved service and increased ROI that we detailed out in our roadmap, it becomes a huge testament to our vast industry knowledge and expertise. Strategic implementation planning – we work with you to translate our high-level roadmap into a more detailed implementation/project plan. We help to identify milestones, establish resources, and develop a clearly defined timeline. Documentation – this phase includes documentation of any missing processes or user/vendor requirements for critical departments such as training, quality assurance, WFM and operations. Set up, testing and rollout – CHCG will assist with implementation oversight and management and will provide strategic input regarding roll out. We will ensure key milestones are met and that progress is clearly communicated to your team. Ongoing optimization and handoff – CHCG will assist with coordination of “Go Live” stage and will provide ongoing evaluation of the newly implemented solution. CHCG will provide strategic input to help maximize the effectiveness and optimization of all technology and processes will work collaboratively with you to obtain valuable feedback on the new solution. If you are looking for an expert, results-driven guide to help you navigate through the complex process of implementation for your contact center, look no further! Fill out our form today for a free proposal and see how we can help!